Clothing/Jewelry Description A gray cotton coat, a blue dress with a design of small animal figures along the lower hemline, red knee socks and black shoes. Distinguishing Characteristics African-American female. Black hair, brown eyes. At the time of her disappearance, Adele had her hair styled with waves at the sides, and bangs. 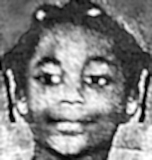 Adele was last seen in Flint, Michigan on November 21, 1958. She was a second-grader at Jefferson Elementary School and had stayed home from school that morning because she had a cold. In the afternoon she decided to go to school. She stopped at her grandmother's house, just blocks from the school, on the way there. Adele was last seen leaving her grandmother's. She never arrived at school and has never been heard from again. Police stated they had reliable reports of a young man carrying a small girl to a dirty black Chevrolet, between eight and ten years old, which was near the creek on Lewis Street. The man is described as a light-skinned African-American wearing a gray coat and red socks. He has never been identified and it's unclear whether he was Adele's abductor, but other children who attended her school said the driver of a car fitting that description tried to lure them into the vehicle in the days preceding Adele's disappearance. Adele is part of a family of nine; her father was a factory worker in Flint at the time of her disappearance. Her case remains unsolved. Updated 3 times since October 12, 2004. Last updated March 8, 2016; details of disappearance updated.